At last, a beautifully warm day with sun shine. Low 60's and not much of a NE breeze. A perfect day for Rob to try out a golf swing....... the first since last summer's back surgery. 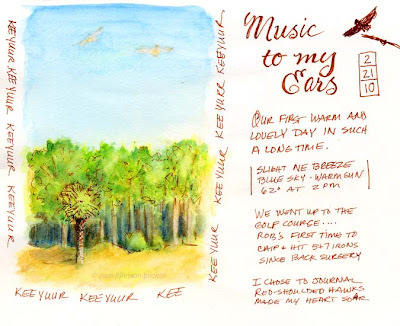 I chose to journal, especially when I heard a pair of Red-shouldered Hawks calling in the air. I'm happy to say Rob felt no more pain. He appeared much more fluid in his swing. He didn't feel the fusion what so ever. Sounds like a glorious day all around! Your journal page is the perfect relection of that. the colours are spring personified PJ! Beautiful page, as usual! 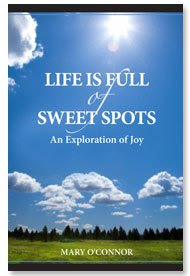 We all could use a few happy days, Pam - and thanks for sharing your's with us! We are having a melt-down, too - temps in the 40Fs are causing the ground to show through the layers of snow!! YAY! Pam, where is Coastal Art Supply, is this a real art store?? We have been looking for an alternative to Michael's, hopefully this might be it. Your journaling looks like fun. Hi Pat! Yes, a real art store!! In Beaufort - 812 Port Republic Street (one street behind Bay). And, it's right across the street from the lovely Beaufort Inn. Give Jennifer a call at the store 524-2787.